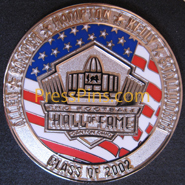 Pro Football Hall of Fame Class of 2002 Player Pin. 3500 of these pins were issued to HOFers, their families, VIP Dignitaries, and the Media. Allen, Casper, Hampton, Kelly, Stallworth.